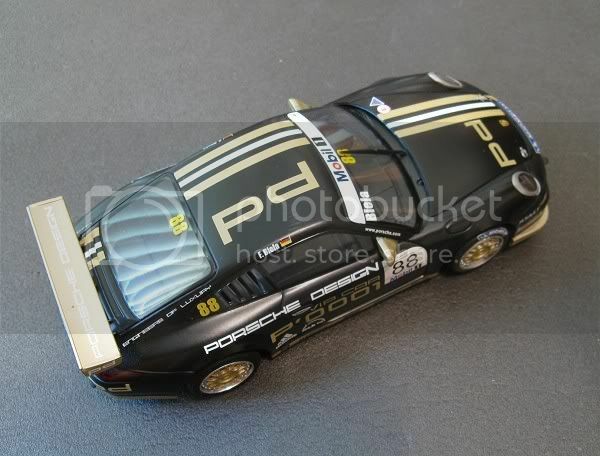 The Porsche Cup is ranked as one of the most popular motorsport events world wide. It invariably supports F1 Grand Prix as it winds its way across the globe. The Porsche marque has a vast army of supporters too and from local club motorsport to International events there are always a good pick of Porsche fanatics to keep the volume up. Frank Biela too is not short of a bit of glory, he started competitively in karts and when he was 18 he took fourth place in the German kart championship. Before too long he was working his way through a wide selection of wheeled competition. 1984 saw him enter Formula Ford and three years later he was racing German Touring cars. 1991 saw him win the DTM series and at his first attempt in 1999 he claimed third place at Le Mans with Audi. For a while he also raced the notorious Audi A4 in the British Touring car championships. The following three years saw him win consecutive races at Le Mans and including 2006 and 2007 he has totalled five outright wins in all. His motorsport experience doesn’t end here and he is still active as a guest driver for various teams and has been competitive in the North American ALMS series. 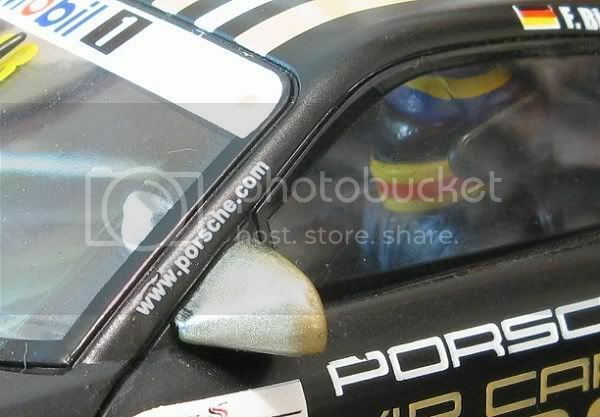 One of his more recent ‘cameo’ appearances was for Porsche AG at the Porsche Supercup round at the Nurburgring, Germany in mid 2007. This time he was driving a factory GT3 rated at a standard 400 bhp. The series already has some strong drivers like Damien Faulkner, Uwe Alzen and Richard Westbrook and Frank’s appearance was more a publicity exercise. He qualified 21st on the grid and finished 18th and surprisingly, this was the only round of the 2007 series he contested! So what’s this to do with the subject matter, well, exactly that the model SCX chose to render was the self same car driven by the self same person. A lot of time and expense spent on a model which had one outing with its named driver?? But I digress. It’s not important who drove what, and why SCX chose the livery. What’s more important is, how does it go??!! 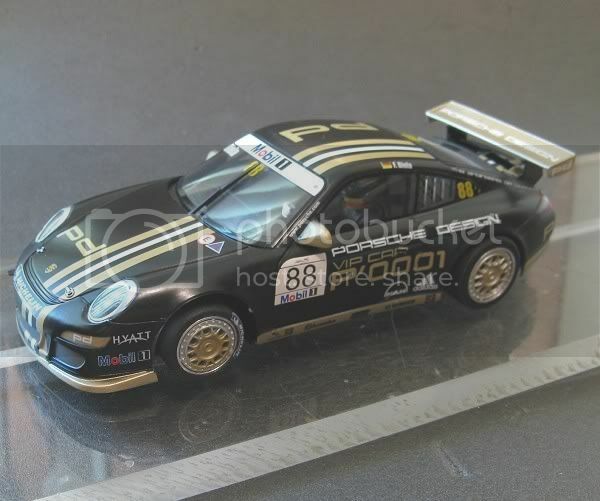 The model is one of the SCX Pro GT series which started life with a rather quick Audi R8 and a just as quick but less stable Citroen Xsara. The model comes in a presentation box and is stripped down into its components. In the bottom of the box is a rather weighty tome describing assembly and tuning in a number of leading languages. Fortunately the English section is at the front making it easy to find (if you need it). Assembly of the model is basic and straight forward. 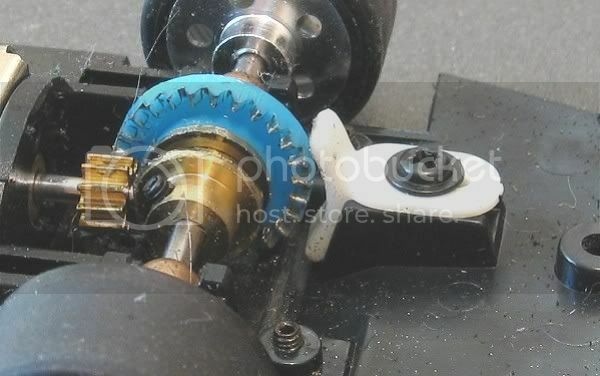 The use of Allen grub screws simplifies it heaps and with minimal body and chassis parts the model should be ready to race in less than ten minutes. 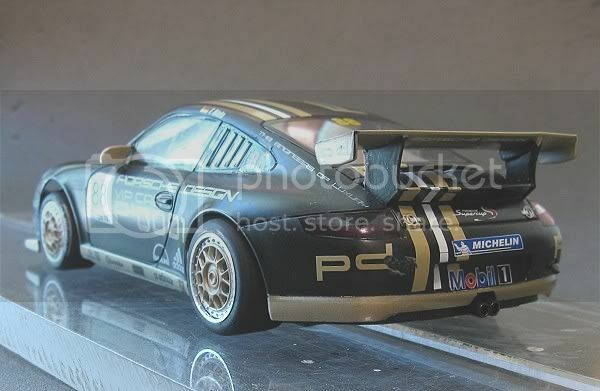 Lots of rethinks on this model and it is quite a departure from their home racing models to the point where they have printed on all sides of the box ‘Only for competition’ Mmmmmm? But I think we’ll be the judge of that. The model came to me via a slotracing friend and was ready assembled. It also had a pair of local MJK tyres on the rear which would definitely enhance its on track capabilities. It also came to me at a race meeting which provided a golden opportunity to carry out some meaningful road testing before reviewing it. But in this case I will still give the review before the test. As always, first impressions are what count and this model is well detailed and the tampo and other decorations are very well done. The smallest print is readily discernable and the GT stripes are crisp and clear. Smaller detail like the bonnet and boot locking pins are very tidy and the remaining small detail is very well done. The body itself is what can only be described as minimal. Not in detail but in assembly. The only separate parts apart from the driver’s tray are the rear wing and the wiper blade! SCX have been very clever here. The body is a one piece injection moulding in clear plastic, yes, clear! This has allowed them to tampo the body colour as well as the detail like light lenses and rims, leaving the clear parts like the screens and headlamps unpainted. Also the model has some very firm and rigid door mirrors which are unlikely to be knocked off! The drivers tray is minimal too and lightweight. The whole body is quite thin and weighs in at 18 grams!! A good starting point for a ‘competition’ model. And as with all good ‘competition’ models, there is little to get broken. The chassis in keeping with its predecessors, incorporates ideas new and old. First thing that catches the eye is an inertia brake on the crown wheel. 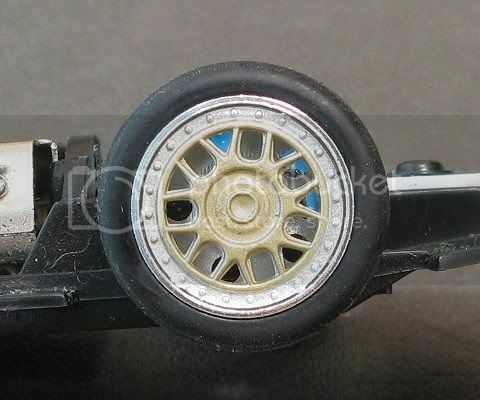 The motor pod slides back and forwards a couple of mm and when adjusted properly, on the overrun the chassis will slide forward on the pod and bring the brake into contact. As the inertia reduces, so the brake backs off. 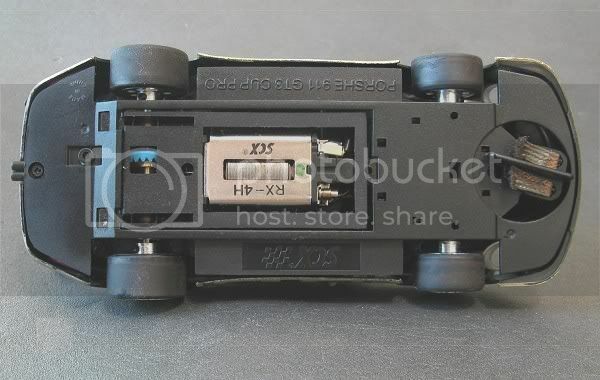 I find this an unusual idea which must be for bigger six and eight lane tracks as usually, most SCX model motors will lock the back wheels up anyway until the track/controller brake function is backed off! The guide is a simple idea and wins hands down over the self centering guides of their ‘home racing’ models. 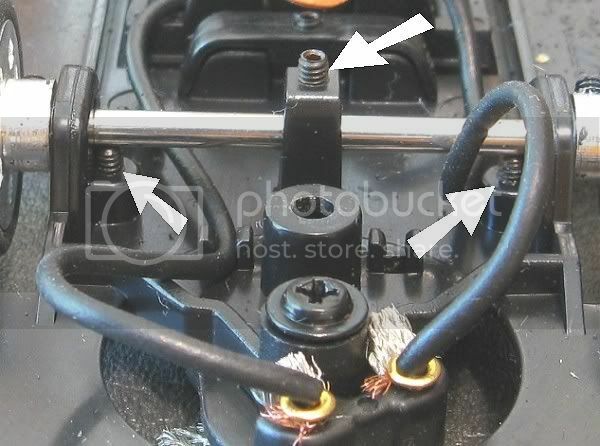 Much like Slot.it, the lead wires are clipped into the front of the chassis and the natural springiness ensures the guide will self centre, minimizing all the moving parts previously used. 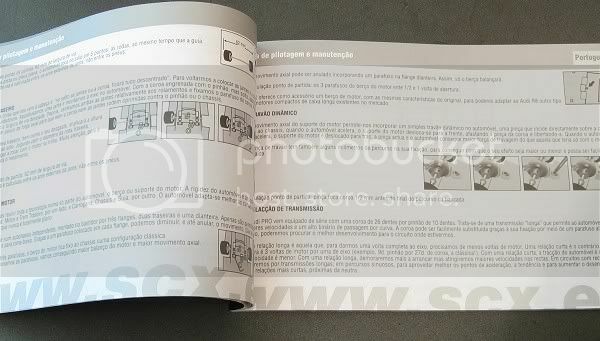 Also unusual for SCX is the ‘hard wired’ guide. No cantankerous quick change system with spring tensioned slippers. Another departure is the front axle set up, what looks to be hard steel axles with grub screwed machined alloy wheels and nice inserts. Also, the front axle sits in elongated axle mounts. 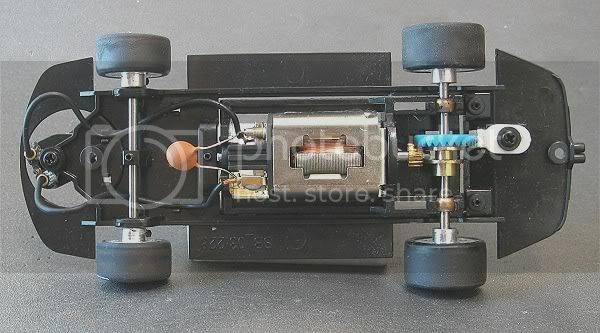 These carry more grub screws which allow front axle height and movement to be adjusted, again something previously only seen on Slot.it models! But SCX have gone that extra yard, and the motor pod has one more function other than sliding back and forth! The front and rear ‘tongues’ of the motor pod slide in chassis recesses and these recesses are deeper than the tongues, but the pod is kept in place by three grub screws which tighten down on to the tongues. Fully tightening them will lock the motor pod in place and progressively backing them off will see the pod become more and more loose until the chassis will virtually drag along the track. 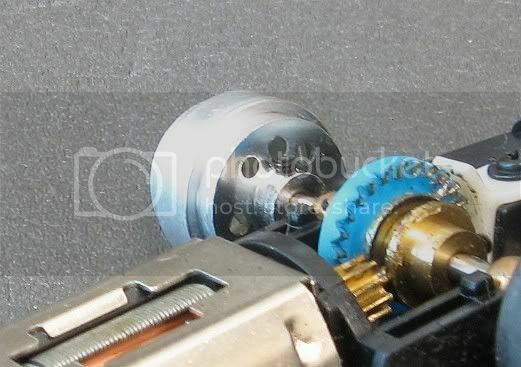 Again, this mimics the same action as the Slot.it pod but incorporates the inertia brake movement, and reduces the need to loosen the body screws. And while we are on the matter. 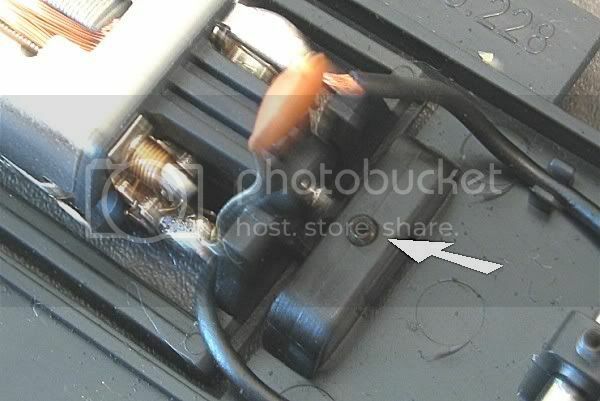 The body has just two screws mounting it to the chassis. 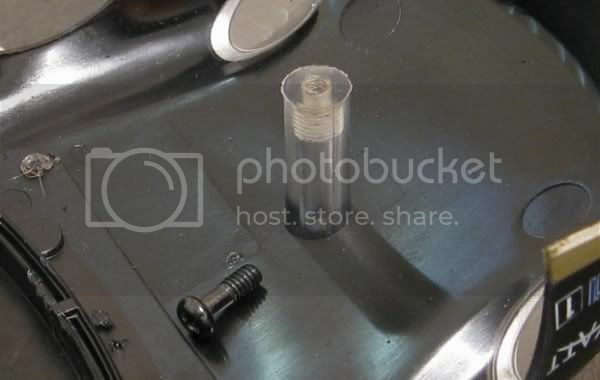 Both of which are set screws almost and not the usual ‘PK’ type screw, and a good tight fit in the clear mounting posts! I don’t see these working loose mid race! The chassis is primarily a ‘non magnet’ chassis. Apart from a couple of convenient holes where you can lube the motor without dismantling it, there are no fixtures to mount any of SCX’s previous downforce products. 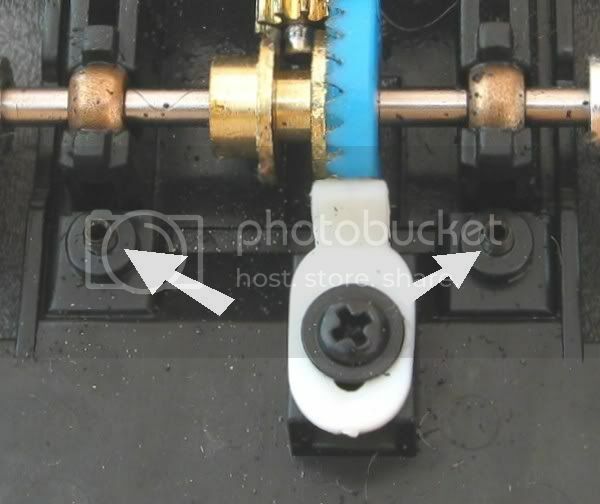 Indeed, there are no blatant magnet mounting points at all! So we have to surmise that this is an out and out board track / non magnet racer, which is good, as this is what it does best! And with its new RX-4H motor it does it quickly too! So what was the track test like? I ran it on a medium sized flowing four laner and trust me when I say it has got speed! Plenty enough for $69.00! Maybe too much? Mmmmmm? Well, with the model on a middle lane I acted ‘Jack the Lad’ and pushed off and promptly, to my personal embarrassment, and with the owner watching, I deslotted quite heavily. (Gulp) but nothing broken. I then completed the lap and did the same thing again, but not quite so heavily and finally, after probably five laps, I made it through the toll tunnel and out the other side. A totally deceptive model which needs a few quiet laps before gunning it. Heaps of straight line but missing the wheel locking brakes of other SCX motors. This is attributable to the 2.6 : 1 FDR and the reduced dynamic engine brakes of this tuned motor. And also to the light model weight. After some more complete laps I got in the swing and the model was proving a little easier to predict. Eventually I settled in to some good lap times for the track and after a little longer I wasn’t getting any quicker. The model has grunt with a capital G, fair brakes but not SCX brakes and with the MJK’s on, it went well through and out of the corners. Apart from the rear tyres it was box standard. No weight, no nothing, and it was lapping as fast as some race prepped sedans, but, it was on the edge. Cornering at max it was skittish and tongue in cheek. But, SCX have created some fine flat surfaces both on the top and underneath the chassis!! Mmmmmmm! And whether you are a purist or otherwise, with a little predetermined weight (maybe ten or twelve grams) either on top or underneath? This model could be transformed into a minor monster. So why the lightweight body. Simple, this allows the C of G to be lowered quite dramatically with frugal post ballasting of the model. No doubt the owner of this model will be thinking that self same thing, eh Norm! Front axle width				57.5 m.m. Rear axle width					61.0 m.m. Rear wheel diameter				19.2 m.m. Progress					23.20 m.m. per motor rev. Rear tyre tread width				10.25 m.m. Guide thickness (median)			1.65 m.m. The 25,000 rpm rated motor doesn’t say at which voltage so I can only assume it is at SCX wall wart voltage (about 13.8v ). For small to medium tracks I can safely say you will have more power than you can harness and probably the best thing would be to increase the 2.6 : 1 ratio closer to 3.0 : 1. This will see dynamic braking increase and braking distances reduced. The inertia brake will be most effective on large tracks, so we need better motor brakes on all but these tracks. Also, SCX are doing a range of SCX Pro spares and these seem to be far easier to obtain from hobby stores (and heaps cheaper) than their rivals. So, this model is full of promise and I for one would like to try it again after it has been set up properly, Norm! What would you suggest Phil. 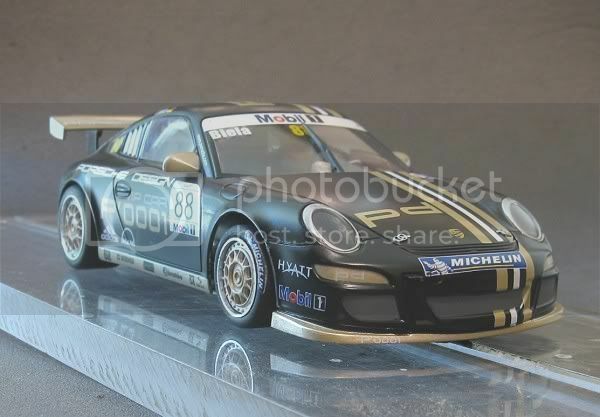 Would you get a Ninco Porsche GT3, a Scalextric Porsche GT3, or an SCX one given you've surely driven all three of the things now. I've always had a soft spot for the Scalextric ones, but after your reviews of the SCX and the Ninco one a while back, the field looks pretty good now. Phil -see if any of your friends has a Pro Audi-and try one -u'd be amazed how good it is!!!! I truly am now in possesion of the SCX Audi GT Pro coutesy of Kev. Well, give me a few days to clear the backlog and we'll put it together and put it through it's paces. Hopefully before next race night! !